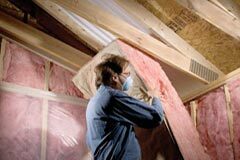 Do you need to install more insulation in your home? Perhaps you need to insulate a new home or community of homes you’re building? Look no further than Momper Insulation! Our insulation team adds energy efficiency, comfort and value to new and existing homes. We have the knowledge, experience and resources that few companies can match. For over 60 years we’ve routinely met the needs of homeowners and contractors across Indiana. As our name suggests we specialize in insulation, but also have experience with spray-on fireproofing, custom shelving and closet installation, mirror design and much more! Contact Momper Insulation online for home improvement services in Northeastern Indiana! With a complete line of the highest quality products available, we have combined our years of experience with tried, tested and approved products that perform well. Momper Insulation has teamed up with some of the most prominent manufacturers in the world to ensure our customers have the most reliable and appropriate solutions for their insulation needs. But we don’t just look for our customers to be happy—we look to create a comfortable, efficient home that satisfies generations to come. Fiberglass – Fiberglass, which has been used to insulate homes for decades, is available as loose-fill or batts/rolls. Fiberglass is made of tiny glass fibers and is often installed in attics but can be used to insulate other areas as well. Cellulose (wall spray) – Cellulose is environmentally friendly—it consists of up to 85 percent recycled material and takes less energy to make than other insulation materials—and can be installed in any area of a home. Rigid foam – Rigid foam insulation is mainly used for new construction projects, and in our experience, it is a great solution for insulating homes and buildings and maximizing energy efficiency. As an organization that strives for continuous improvement, Momper Insulation is at the cornerstone of understanding how new technology works, how to improve current insulation products and the most effective installation methods. We are experts in foam, batts, blown and rigid insulation. Whether you require prescriptive or performance code compliance, we can help design a home insulation solution to create efficiency while using a method that is within your budget. Contact Momper Insulation today for retrofit and new home construction insulation services!